From a recent interview with Incube8r Gallery in Geelong, Victoria where I now sell my work. I was born in New Zealand, and currently reside in Victoria, Australia with my two amazing children Connor and Paige, our cat Cougar, and Houdini and Mr Sniffles, our two pet rats. I have held a camera in my hand since forever, pursuing photography as a hobby for many years before turning ‘pro’. I have exhibited extensively and sell my images internationally including to private collectors and publishers. Tell us about what you create? I create images from the heart! I have to feel it before I can capture it. 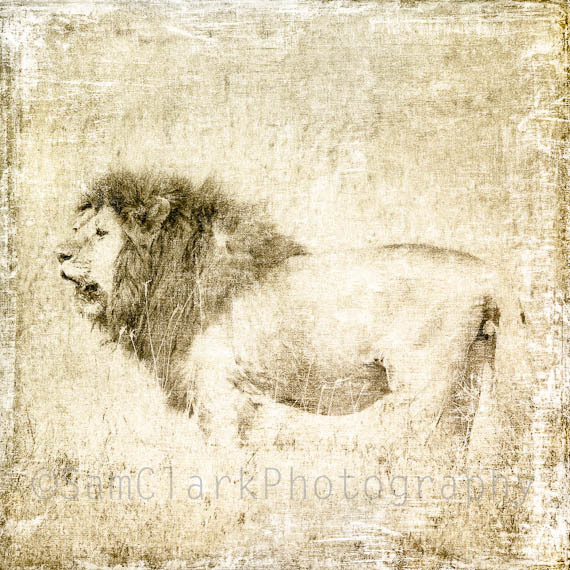 I dabble in various subjects including landscapes, pets, collage, flowers etc, but my true passion lies with the African wildlife, especially the big cats! I produce fine art prints, handmade greeting cards and canvas bookmarks. What made you start making your pieces? There was probably always an influence towards art in our household as kids growing up. My Dad has been a professional artist most of his life as a carver, and my Mum dabbled in drawing and earlier, painting. I have always felt the need to ‘create’, and if I don’t I feel stifled, like something is missing. Photography is not what I do, but more of who I am! What is your inspiration / influences? My photographic direction has changed somewhat over the years. Now I am completely inspired and influenced with everything Africa! I have always had an affinity for Africa, it’s wildlife and it’s people. I ventured there in September 2009, returning 6 months later. It has been one of the most rewarding and life changing experiences for me. I feel like I have found my calling in life, to record these majestic wild animals as fine art animal portraits whilst raising money from print proceeds to help conservation groups with much needed funding to save our wildlife from poaching, loss of habitat etc. I’m hoping as I gain more recognition, my wildlife photography will have more of an impact on such an important cause. I am also inspired by the power of words, and am starting to incorporate this with my images to convey a more powerful message. You will find this on my cards and bookmarks. I shoot with Canon camera gear, use Mac computers, and print on an Epson large format printer. My images are printed onto Fine Art papers and canvas’ using Archival Inks. I find that wherever I go, I am always ‘looking’ at my surroundings. The way light falls on things, textures, patterns, and in Africa, well it’s the spirit of the wildlife in their natural environment. Being with them, observing them, and then shooting whatever catches my eye, usually trying to keep compositions simple yet compelling.. trying to capture the animal’s spirit! Back in my office, I love to ‘play’ in Lightroom and Photoshop, to add my creative edge to my images, to convey the message or feeling that I want. Why did you choose in.cube8r? I came across in.cube8r on the web, and thought it was a fantastic concept allowing artists to showcase and sell their work in an affordable way, enabling us to pursue our love of creating as a career. Thank you for sharing your interview. Your title “Who am I … really?” inspired me to look at your post. The first question, on the first page, in Dr. Tae Yun Kim’s – Seven Steps to Inner Power eBook is “Who am I?” She encourages people to look inside themselves for who they are. You’ve done that. You are most welcome, and thank you for your comment, it is very much appreciated!